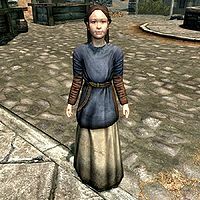 Mila Valentia is an Imperial child from Whiterun. She is the daughter of Carlotta Valentia and helps her mother selling fruits and vegetables at her stall in the plains district. If you kill her mother, she will start to dislike you. She gets out of bed at 9am and immediately heads to the market for two hours. At 11am, she abandons the stall and instead runs around town, playing and having fun with Lars Battle-Born and Braith. At 5pm, she returns to her mother and waits for her to close the stall at 7pm so they can go to The Bannered Mare for dinner. At 8pm Mila returns to the Valentia residence for an hour of relaxation before her early bedtime at 9pm. Mila wears a set of child's clothes with a pair of shoes. She carries a variety of food and toys and the key to the house. Mila: "Can you close up the stand early today, mama?" Carlotta: "I'm afraid not, little fairy. The fruit has about another day left before it spoils. We've got to sell as much as we can, as soon as we can." Mila: "That's what you always say." Carlotta: "Because it's always true." Mila: "Can we at least go to the tavern for supper?" Carlotta: "Tsk. And to think, I was going to feed you cabbages and apples again. Yes, little fairy, we can go to the tavern for supper." This page was last modified on 22 June 2018, at 04:55.